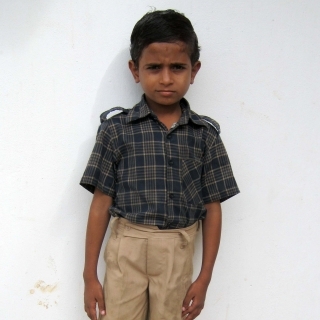 Summary: Nettie Gill reflects on a visit to an Indian orphanage. Although I had read many stories of India and also learned much about the country in school as a child, I was not prepared for the sights and sounds of the cities and the countryside. The city streets are jammed with traffic. The cows and bullocks walk unconcerned down the highways and streets and no one seems to mind. Whole families ride on one motorcycle. The father drives, with one child riding in front of him, another child immediately behind him, and the mother riding on the back, holding a baby, her sari scarf flapping in the draft created by the cycle. I will never forget the first time I saw a leper. It was revolting, but I couldn’t help but look. In my mind I remembered the Biblical accounts of lepers calling out, “Unclean, unclean!” as they walked along the thoroughfares of the villages and cities. What a sight to see fingers and toes gone, chins and noses no more in existence. Most of these people beg as a means of survival. In one city, we stopped our vehicle in front of a shop. A lady with a very tiny baby that looked more dead than alive came to the window asking for money. We gave her a few coins and it wasn’t long before another lady came along to beg, carrying the same baby. One wonders if the child was kept in a near starved state just so that people would have pity on them and give them money. Then there were the blind, the crippled, and the street children. When we would walk down the street, we would sometimes be surrounded by half a dozen children all begging for coins. They would get down on their knees and wipe the dust off our shoes if we didn’t have time to stop them. We realized later that some of these children actually work for adults. They feed the children and give them a place to stay. All the money the children earn is turned over to them. My heart went out to those children. Some of them were dressed in absolute rags, with dirty bodies and sad, empty eyes. We were told that some of these children were actually left to fend on the streets because the parents couldn’t feed them. The father might be an alcoholic, and the mother might work in the fields to bring home rice for their food. But there would never be enough for the growing family. How sad! It made me wish that this sick world would be over with and that Jesus would come soon and put an end to the misery that we saw all around us. The smell of garbage pervaded the streets. Some merchants try to keep the area directly in front of their shops clean, but it is almost an impossible task. The cows come by depositing their waste and urinating. People throw their paper wrappings or plastic bags on the ground. Vendors leave their rotting fruit to continue their decay on the sides of the road or on the sidewalks. One day as we were walking, the stench was so bad that we decided we would take the next street over. But, going down the next street was even worse. Lined with open sewers, the street was being used as a public toilet. We didn’t try that again. Going to the villages was a much pleasanter experience. There still was the smell and the people relieving themselves on the side of the road, but the people were so pleasant and they seemed cleaner somehow. People loved having us come to their home and praying with them. We tried to get to as many homes as possible. In many homes there would be someone who was ill. We would pray for each one. I thought of how Jesus went to the villages and when He left there was not a sick one in the village. One sick lady was really weak and pale. After we had prayed with her and left her to go to the next house, we heard someone running after us. As there were many people following us from one house to another, we didn’t pay too much attention. But finally the lady came up and got our attention. We recognized her as the lady that we had just prayed for. There she was, happy and smiling and well. Praise the Lord! He is still in the business of healing people! Two years ago we decided that we had to do something for the children in Pastor Daniel’s district. We decided that we would help build an orphanage for that area. It would take care of the needs of 100 children. That orphanage has been completed and is full. Not all the children are totally orphaned. Some of them have one parent, but that parent is not able to look after and feed all their children. So they have requested that the orphanage would take care of their child. The name of the orphanage is “Balm of Gilead Refuge Home.” Here the children are clothed and fed. They are taught Bible stories and songs. Each one has a bed with a thin mattress and a blanket. There are two to a bed. The orphanage provides them with two meals a day at least. The yard at this orphanage is very small and so there is not a lot of room for the children to play. We had hoped we could buy a lot that was next to the site so there would be more room for the children and a place for a garden. Next to the orphanage a school was built by a dedicated husband and wife from British Columbia. This school has the capacity to educate 200 children: the orphans as well as some of the children from the community. Without an education, the orphans have very little opportunity to get ahead in this life. Each month there are expenses to meet at this orphanage. Food, clothing, and medication are all needed. Also, the salaries of the six school teachers and all the caregivers need to be paid, as well as the bills for electricity and other incidentals. There are real needs to be met, which can be covered by approximately $2500 US per month. God has been so good to us and has planted our path in pleasant places. We have a responsibility to help those less fortunate. This November we are planning on going to India again. Every week and sometimes daily, we have calls from India requesting that we come to work in the villages. There are about 75 villages that are waiting for us to come and evangelize. One of the Conferences has asked my husband to train about 78 Bible workers. These workers have had no formal training in how to reach people, and some of them have little knowledge of what our church teaches. So this is a priority. During the training we will have to house and feed them in a central place. Presently all of my husband’s sermons have been put into book form and translated into the Telegu language. Three thousand copies are now printed and ready for distribution. This will be a great benefit to the Bible workers as well as the pastors in the area. The needs are great and we ask for your prayers and means for the work in this nation. God bless you as you consider what you can do for the work in India. Thank you for what you have done in the past and in advance for what you will do. Inasmuch as ye have done it unto one of least of these my brethren, you have done it unto me (Matthew 25:40).